Designer Richard McGee joined Holloways of Ludlow as Senior Designer in 2015. His previous experience in the industry includes many years as a designer at Ripples, and as a consultant at luxury interior design company Evitavonni. Consequently, his technical knowledge and creative flair, combined with interior design experience combine to give him the confidence to produce ambitious kitchen designs, often mixing authentic materials with modern design features. Earlier this year, Richard was delighted to win the ‘Kitchen Designer of the Year’ (£30-50,000 category) award with this kitchen design at the 2016 KBB Review Retail and Design Awards. Q: What were the main priorities in your brief from this client? The owner of this period terraced home in London is a keen cook with an eclectic style and she wanted a kitchen where she could enjoy her love of cooking and entertaining. 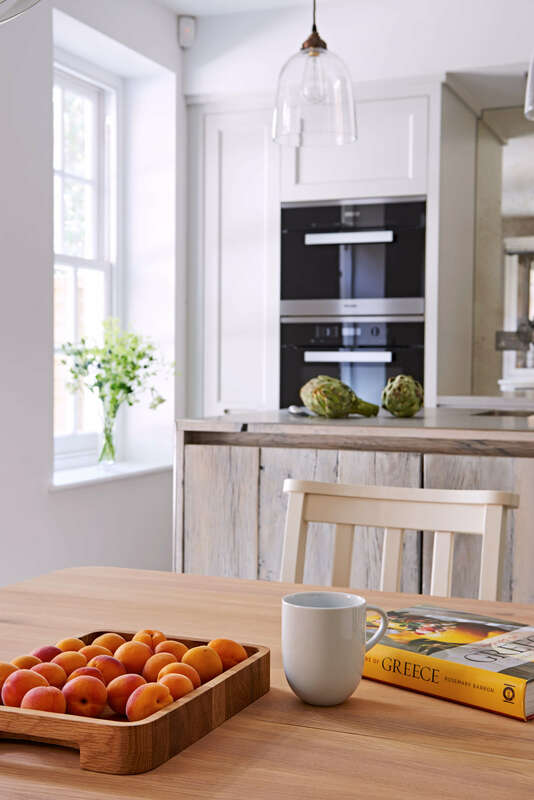 The owner’s interior taste tended towards the ‘classic’, but she also expressed that she wanted her kitchen to have an ‘industrial twist’, and to avoid the look of a fully fitted kitchen. She was also keen to allow the design to include freestanding furniture. The original kitchen space was separated by an internal partition, and we discussed whether this could be removed to create a larger kitchen. After browsing through magazines with her, I began to make mood boards showing the desired kitchen style. They had to answer a specific brief – which was to create an airy, eclectic family kitchen space with an ‘industrial’ tone and which would work as a space for relaxing, entertaining, and of course, cooking. The mirror used behind the hob area is a tried and tested way of adding interest and bouncing light back into the room. I combined a mix of contemporary built-in and freestanding cabinets, using a wide range of materials and manufacturing techniques. The Shaker style cabinetry for the rear wall units was hand-painted in Farrow & Ball’s ‘Amonite’ and it’s perfectly complemented by Concrete LCDA worktops. The pull-out cabinet beside the ovens means ingredients are easily to hand. We also went along with the suggestion to remove the original partition in the space. It was replaced with a double glass door entrance, which allowed light to flood in from the front of the house. Our client enjoyed entertaining and had ranges of crockery and cutlery that would be displayed in the freestanding dresser unit. This unit also incorporated an integrated dishwasher and bin so crockery could be loaded straight into the dishwasher. This decision meant that their finer crockery wouldn’t mix with their everyday kitchenware, as there was an additional dishwasher within the island. The second freestanding styled unit with glass sliding doors helped the kitchen move away from the fitted feel. This also housed the decorative breakfast items in jars, coffee machine, and toaster for relaxed breakfasts with everything close to hand. To answer the ‘industrial’ design hint, the island unit, which was been made using reclaimed oak floorboards, with a stainless steel wrap-around worktop was designed to become a central focus to the space. The island unit contained storage drawers, waste drawers and a second dishwasher. Extraction was a keen component in the larger kitchen space, and in order to achieve the necessary ducting for the extraction route, we had to lower the ceiling over the hob area. The kitchen had two windows to enhance natural light into the space, and the addition of recessed spotlights, glass-blown pendants and Verpan Moon pendant provided a minimalist finish to the kitchen. I really like the way the kitchen feels so light at airy and how the kitchen has a classy yet industrial feel. The mixture of classic cabinetry sits well with the contemporary island because of the use of reclaimed oak floorboards. The freestanding piece enhances the whole kitchen – making it feel open, friendly and airy.